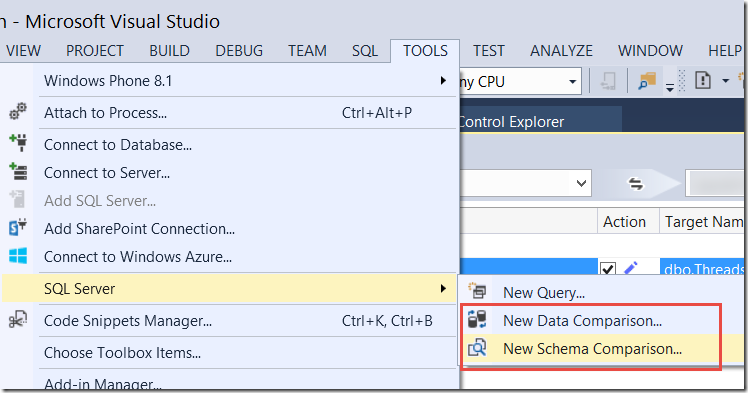 I was thrilled to discover the functionality to compare database data and schemas is available in Microsoft Visual Studio. It not only allows you to compare two databases, but it will update the target database or write an update script for you to allow you to update the target database. 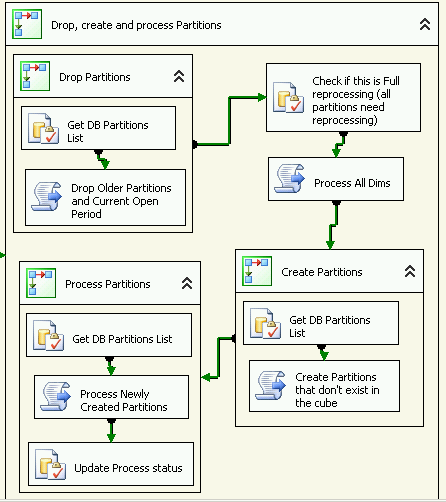 Most of this functionality has existed in Visual Studio Team System Database Edition since 2005. Team System Database edition is used by database developers and administrators and includes advanced tools for database change management and testing. 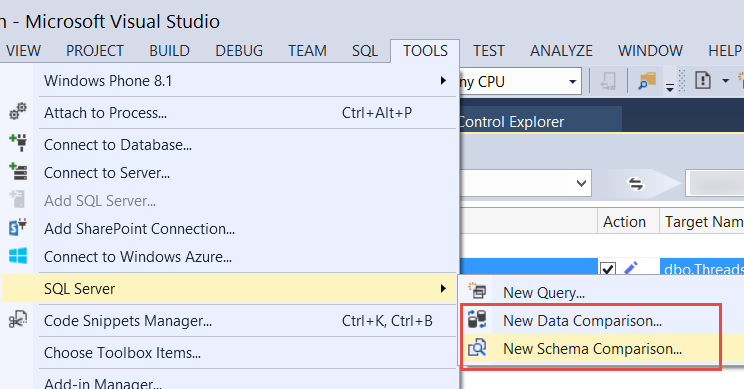 Database schema comparison is now available in Visual Studio Premium and Visual Studio Ultimate since 2010. Unfortunately it’s not in Professional or Express. 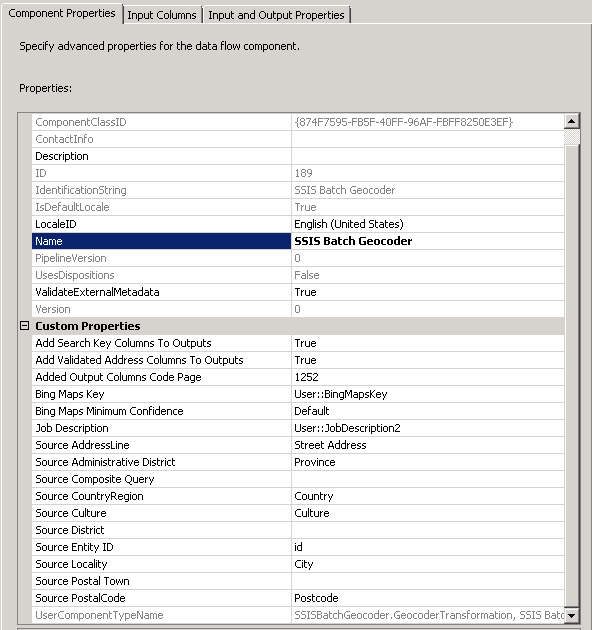 Having the database schema compare functionality in Visual Studio is awesome for developers who straddle several worlds. It’s nice to be able to build an application that affects or relies on a database, and also be able to compare the database schemas among environments, even if building the database doesn’t fall within your purview, all within one tool. Click Compare and it will compare the databases. Here I have compared the schemas of two databases. The tool highlights the differences. In this case a new field called [newfield] exists in the table [Threads] in the source database but not the destination database. 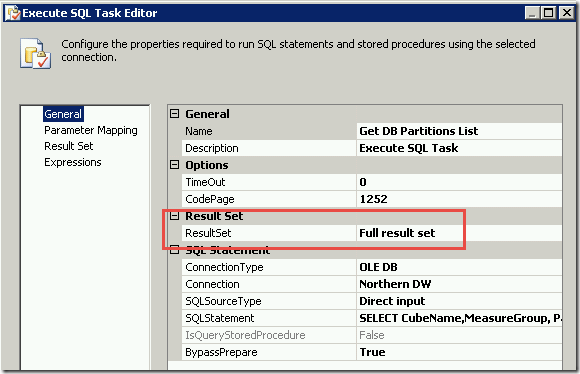 Click the script icon to generate a SQL script for the changes to the destination database. Or click the Update button to actually do the update of the destination database. How sweet is that? I know I’ll be using this regularly in all kinds of development. 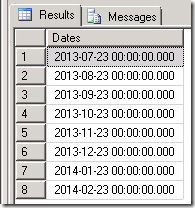 I have a client who wants to create report subscriptions which run on the last day of each month. I am surprised to discover that this doesn’t come out-of-the-box with Report Manager. The subscription schedule allows a number of options by hour, day, week, month. 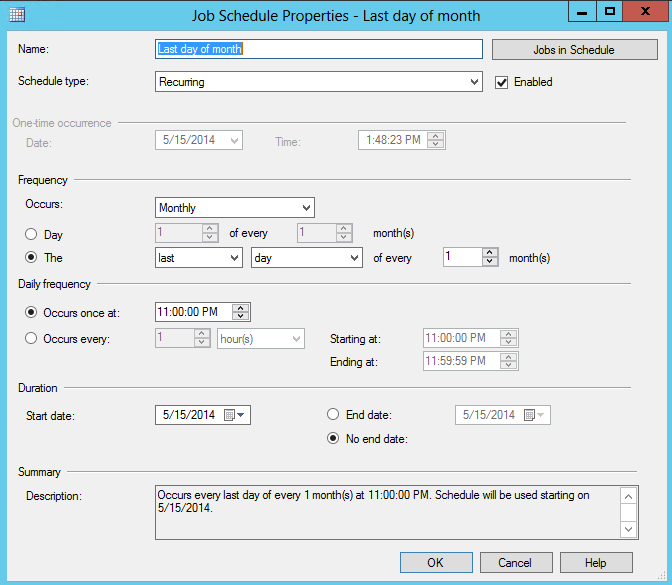 The Monthly Schedule option allows for Last week of month, but the user then has to choose the day of the week or calendar day. And when I insert 31 as the calendar day it gives an error message, presumably because some months do not have a 31st day. There is no option for last day of month. Here is one workarounds to this: One option would be to run the subscription on the first day of the month, defaulting the report to the previous month. For this to be an option you would need : 1. 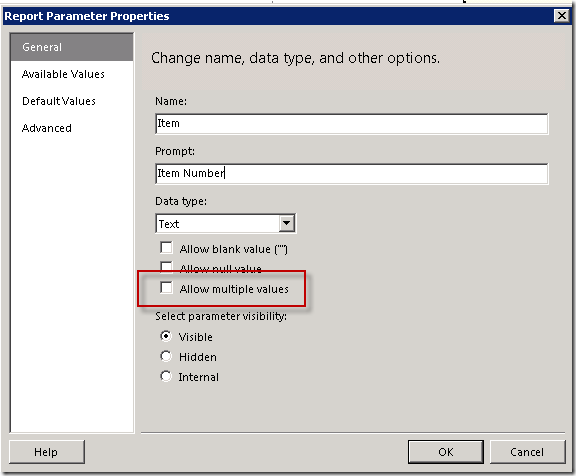 A data parameter in the report and 2a. The report already defaults to the previous month or 2b. 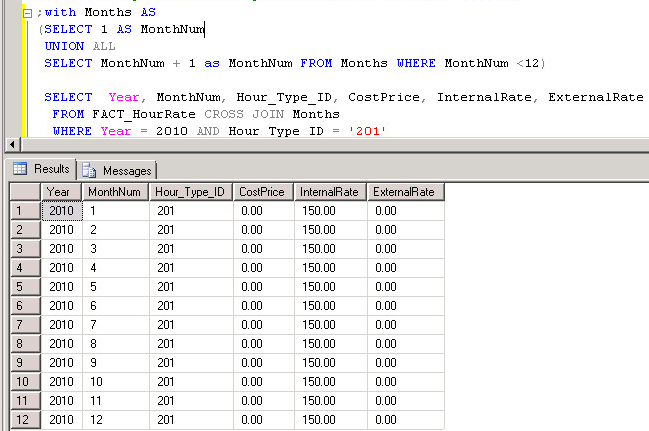 An edition of SQL server which supports data driven subscriptions in order to override the default parameter to last month. This is not an option for my client. The solution that worked was a little different. You need access to be able to create a Shared Schedule on the Report Manager site, and access to the ReportServer database and SQL Server Agent on the report server. 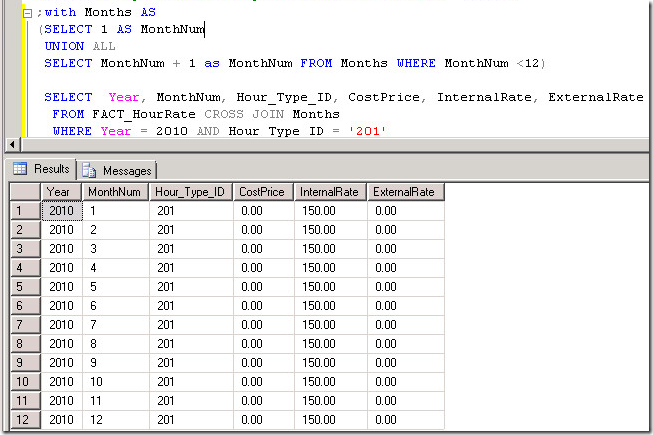 What you will do is create a Shared Schedule, which in turn creates a SQL Server Agent job. 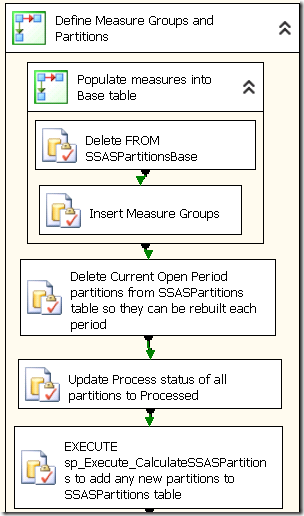 And then you will edit that job in SSMS to run on the last day of the month. Any report subscriptions can then use that Shared Schedule to run on the last day of the month. You could do something similar for each individual subscription, but why would you, when you can do it only once in a Shared Schedule. 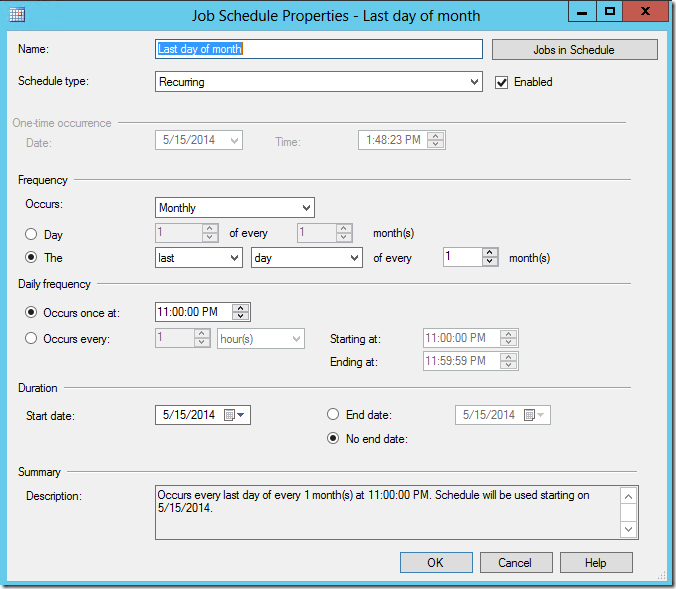 In Report Manager, go to Site Settings and select Schedules. You will need the right permissions to be able to access this. Click on New Schedule. Create a schedule. It doesn’t really matter what you set it to, since you will be changing it on the back end. Note that the front end Schedules list will reflect the changes that you make to the back end, but if you try to edit the schedule your original values will still be there. Give the schedule a descriptive name to identify it. I called it "Last Day of Month". 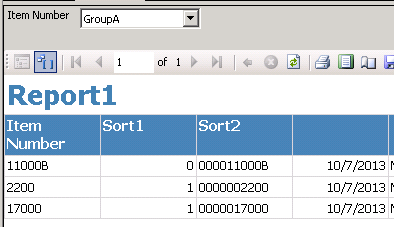 Run this query in the ReportServer database to find out the ScheduleID. 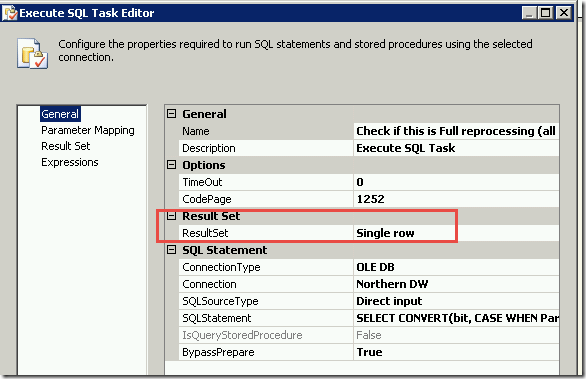 In SSMS navigate to SQL Server Agent and find the corresponding job. Make sure the schedule is Enabled. The Shared Schedule will reflect Last Run and Next Run values correctly in the Schedules pane. Note that the details of the schedule will NOT reflect this, since it is not an available option in the Report Manager interface. Now a user can choose this schedule when setting up a subscription. I found this blog by Andreas Halleraker really helpful in finding a good solution. If you just want a quick and dirty way to format row delimited data into comma delimited for consumption in a query, you can use Word. First you have to turn off the Autocorrect for Smart Quotes, otherwise you will get smart quotes instead of straight quotes in your query. Depending on your version of Word you will find AutoCorrect under Options in the Proofing section or under Tools. You then just need to add a single quote at the beginning and remove the last comma and quote. This is really specific, but I had to hunt around to find out how to report on historical receivables in Great Plains. This will get the multicurrency receivables, but you can modify it to get all receivables. 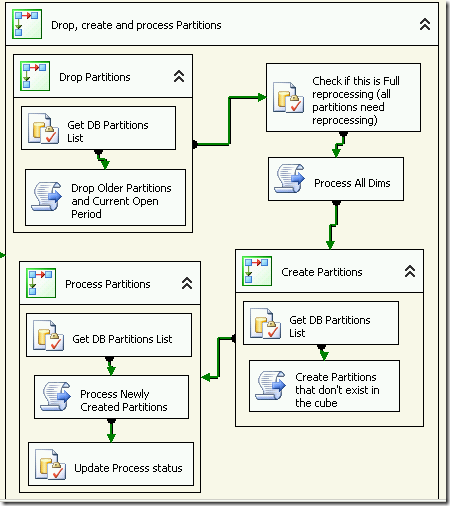 I’ve written a stored procedure which goes after a cascade of other stored procedures created for the Great Plains reporting. I chose to use a stored procedure so I can pull the data as it is provided by the GP stored proc using the variables that that stored proc requires, and then adjust the data to meet the needs of my report. --TODO: Set parameter values here. This little trick has helped me keep SQL code clean when generating data. 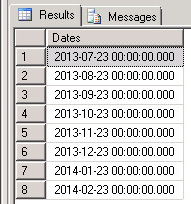 There are many times where I need to generate a series of months in a sql query. 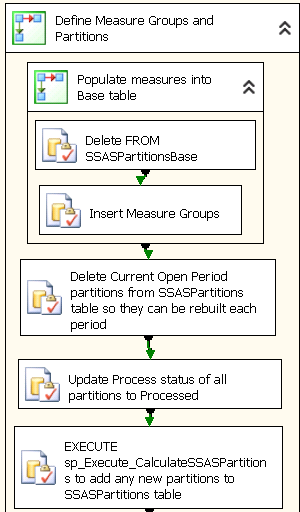 Very often it is needed in order to join two incomplete sets of data by date, or to cross join a set of data to spread it across a series of months. This is a very simple solution which can be adapted for many other needs. You can start by using a ‘with’ statement to generate the values you need. In this example I will generate the numbers 1 to 12 to represent 12 months. I have run into this issues several times before, where I am VPN’d into a client and have an RDP session open, and then my VPN gets cut off. When I sign back in sometimes I am unable to connect to the existing open RDP session. Today it was mission critical as I was almost at the end of a very long running process and I had to connect to the same session. After much searching I came up with the solution. It is a combination of two tactics that does the trick. 2. 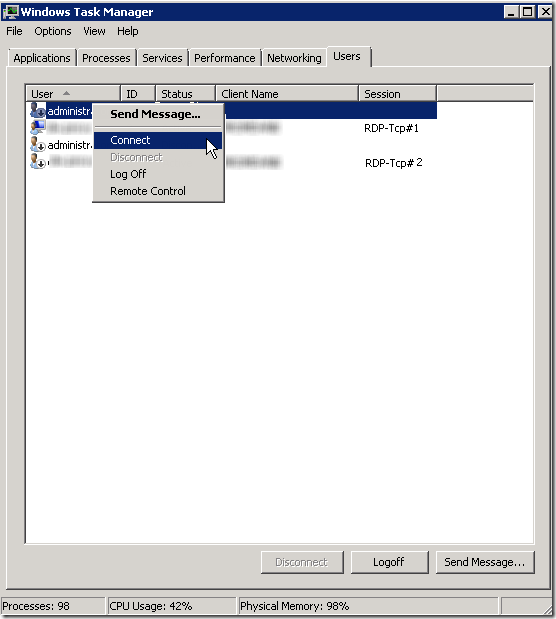 Open up Task Manager on your server in this new session, right click on the session you want to reconnect to, and click connect. Super easy once you know how! I found the following two articles helpful in the writing of this post. I’ve had to do some geocoding of addresses. It used to be free to process a lot of addresses, but now that this is a more mainstream activity you generally have to purchase an Enterprise License. This can cost upwards of $10,000. If you have a very small number of addresses you can use a free service like Bing Maps, which currently allows you to process 50 records at a time, and run 5 jobs per 24 hours. This means a maximum of 250 per day. If you want to check out how this works, here’s how. You need to have or set up a Microsoft account to get a key. Follow the instructions to get a Basic Key. If you have a large number of addresses you will want to look into purchasing an Enterprise License. 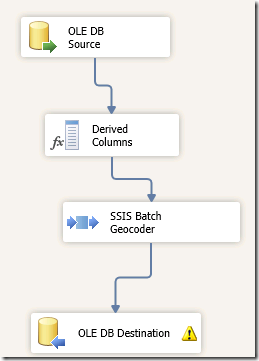 Create a Visual Studio SSIS project. 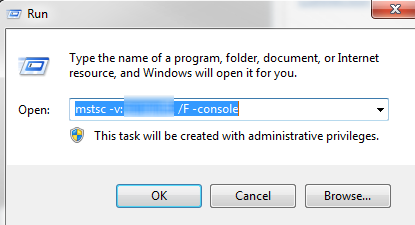 If you can’t see the toolbox, in the Visual Studio Menu choose View – Other Windows – SSIS Toolbox. If you can’t see the Variables window, in the Visual Studio Menu choose View – Other Windows – Variables. 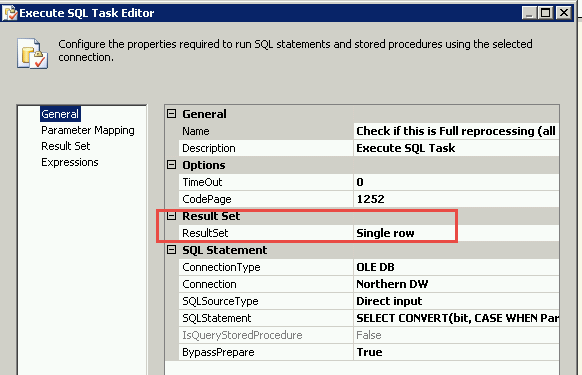 Configure the OLE DB Source to connect to the table that contains the addresses. 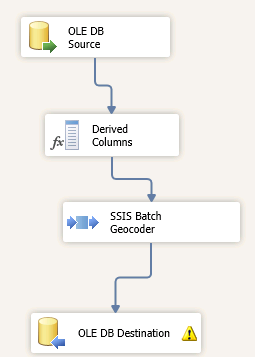 Configure the SSIS Batch Geocoder like this, using the two variables as the Bing Maps Key and the Job Description, and mapping any other relevant columns from your data. 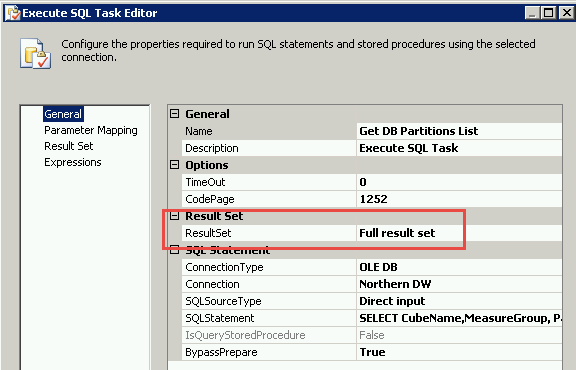 Configure the OLE DB Destination to wherever you want your output to reside. Choose whichever output fields meet your needs. 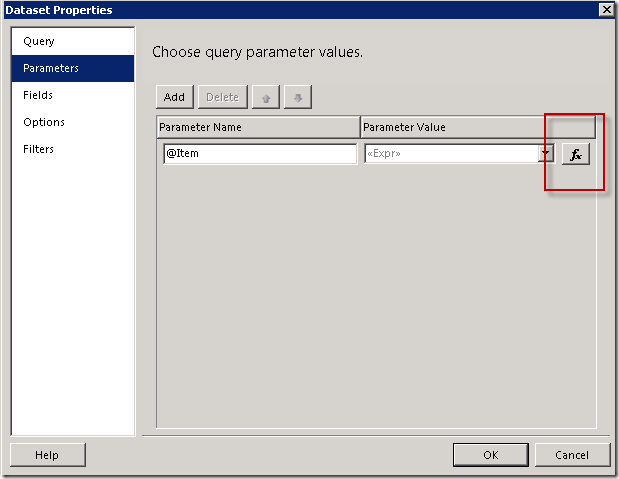 The latitude and longitude output can be stored in a field of SQL data type “Geography”. In preparing this post I found these articles helpful. I’ve seen this issue a lot lately. 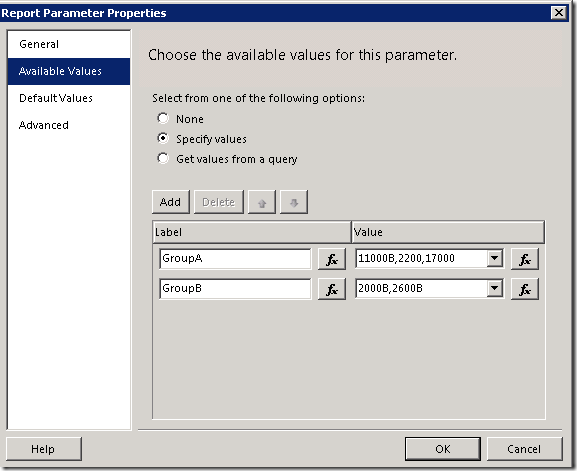 There is a need to feed a comma delimited string of values into a multi-value parameter in an SSRS report. There is a simple way to do this. The parameter should be set up as text, but NOT allow multiple values. You can set this up as you wish to meet your purpose, but for demonstration I will set up two groups of comma delimited strings as available values. 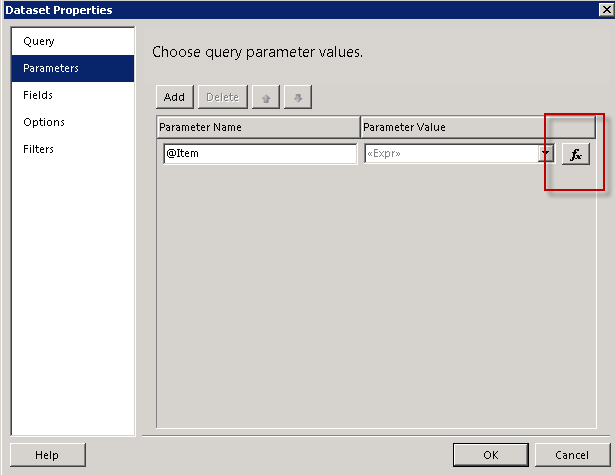 I have set up a second data set to feed these default values to the parameter. Now comes the magic. 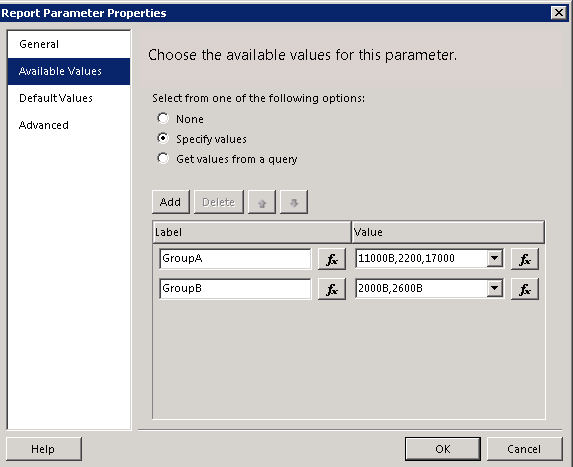 On the Dataset Properties for your main report dataset, on the Parameters tab, edit the expression for the Parameter Value. This will take the comma delimited string as input, split it into individual values and it will get used in the IN clause of the main query that we set up at the beginning of this post. 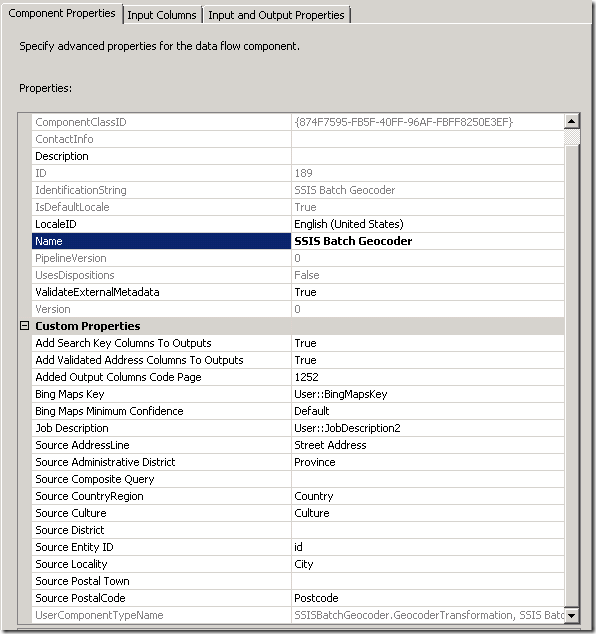 Viola, the report filters on a string of values. 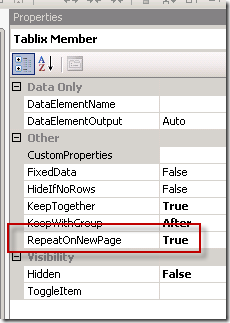 Here’s an easy way to alter your group header on subsequent pages in SSRS, without using any custom code. Do this by selecting the small triangle at the top right of the grouping pane and turning on Advanced Mode. 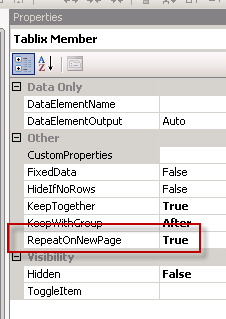 Then select the Static member at the top of your group and set the RepeatOnNewPage property to True. Add the =First(Fields!Row.Value) field into the group header row of your report. Call the textbox RowGroup. Add the Row field into the detail row of your report. Call the text box RowDetail. These fields will be hidden later. Notice in the preview of the report that on the first page of the report the RowGroup textbox = 1 and the RowDetal textbox = 1. The Iif statement dictates that the group header shows the Layout_Code value. On page 2 of the report, since the Layout group continues and 1 <> 49, the work “Continued” is added to the group header. This will carry on until a new group starts and the row number goes back to 1. You can go ahead and resize and hide the column once you have the logic working.